If you think ‘watercolor art’ means only misty landscapes and soupy skies, the work of painter Heidi Rosner may change your perceptions of the art form forever. Heidi brings an exhilarating vibrancy to what is normally a sedate medium and her paintings burst forth with color and energy. 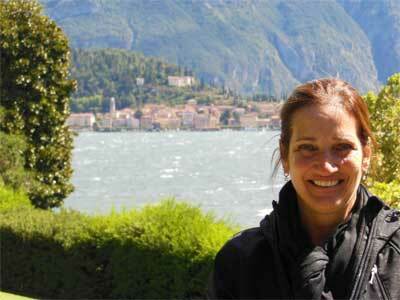 Watercolor artist Heidi Rosner at Lake Como in Northern Italy. A mechanical engineer by trade, Heidi didn’t pick up the paintbrush until 1994. In fact, she was unaware that she had artistic ability. A chance workshop in painting caught her interest and shortly thereafter she began to paint. It wasn’t long before art collectors clamored to buy her work. One aspect of Heidi’s creative process that sets her apart is her experimental approach. Without the preconceived strictures of “shoulds” and “shouldn’ts”, Heidi has developed her own methods of working with watercolors, producing remarkable results. Her method requires layer upon layer of transparent color, a radical departure from conventional wisdom about watercolor technique. Although time-intensive, this approach allows Heidi to develop luminous compositions and apply the watercolor to canvas and wood in addition to paper. Heidi believes she is fortunate to be able to create fine paintings. She wants her clients to feel a connection to the subjects she depicts. To find inspiration for her landscapes, Heidi has traveled extensively, including Italy, France, Spain, Greece, Turkey, Germany, the Baltic states, the British Isles, Scandinavia, Mexico, Central America, Russia and most recently, Morocco and Portugal. For her florals, Heidi draws inspiration from her travels as well as from her gardens in both her Northern California summer home and her Arizona residence, where she grows many of the specimens that end up in her paintings. When she is not traveling, Heidi is working in either her Danville, California or her Scottsdale, Arizona studios. She also participates in the Celebration of Fine Art show held in Scottsdale from January to March of each year where she paints on site daily. I am a self-taught artist who traded a mechanical engineering career for a life in fine art. My engineering background has not gone to waste, however. The discipline has served me well as an artist because it gives me precision in how I approach the structural components of an image: line, light, shadow, texture, and (most of all) color. I paint exclusively in watercolor—a challenging medium that must be applied perfectly the first time due to its transparent nature. My technique also draws from my engineering background; I am able to manipulate the physical properties of the paint in order to coax out the vivid colors for which my work is known. With every painting, my goal is for people to feel as if they can walk into my landscapes and enjoy the experience, or to feel the sun that illuminates my florals. When my viewers share in these experiences, I know I have succeeded. Interested in learning more about Heidi’s work? Please visit the Heidi Rosner Resume page.